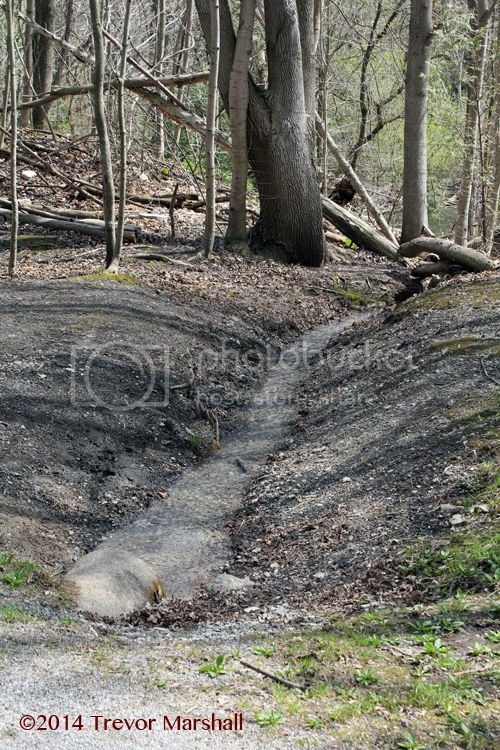 A highlight in the Lynn Valley, this spring-fed tank is the only on-layout source of water for my steam locomotives. I’ve been working on some video for another project, and shot a couple of extra clips on the layout. This is one of them – a brief video of Extra 908 West running past the water tank in the Lynn Valley. I’m always impressed at how well these locomotives run. Getting small steam mechanisms to operate smoothly is a real challenge in any scale, but Simon Parent certainly figured it out. I’m also pleased by how well the camera picks up the environmental sounds – the bird calls and such. They really do contribute to my enjoyment of the layout so I’m glad online visitors can hear them, too. Following some great feedback from readers (you know who you are!) I’ve added not one but two figures to the speeder setoff scene. Sometimes, moving figures about a scene can suggest stories that their final placement can tell. In this case, I grabbed my box of figures, sorted about a few likely candidates, and started trying various arrangements. Then I realized he could be leaning on the speeder – but the question was, why? And what would the second guy be doing? The second figure provided part of the answer – he’s looking down, and wiping his hands on a rag. He looks like he’s thinking. And then it occurred to me that if I added one more detail to the speeder, they could be planning their work at the job site. The two figures together look like their having a discussion, and the first figure could be holding down a plan to keep it from blowing away. Maybe it’s a leak in the plumbing? Maybe it’s an inspection of the pump? Or maybe the guy in blue is showing off the plans for his new layout? Whatever it is, I think it works. To the best of my knowledge, there are no kits currently offered in S standard gauge for a speeder. So I started with a white metal kit for an Sn3 model, Kit T-2220 offered by Wiseman Model Services. When I ordered the kit, I wondered whether it would be a simple matter to substitute longer lengths of wire for the axles – but the prototype on which the kit did not accommodate that. Therefore, I cut apart the white metal frame and substituted appropriately-sized styrene strip to widen the speeder. The shovel was included with the speeder kit. The pipe wrenches are beautifully rendered in photo-etch, and part of the Hand Tool Set (Kit 102) from TractorFab. I thought they would be appropriate for a job call to the water tank. Since this is in the middle of nowhere, relatively speaking, a speeder could not have been left here unattended so I will search through my supply to find a suitable figure to represent the CNR employee who drove it here. 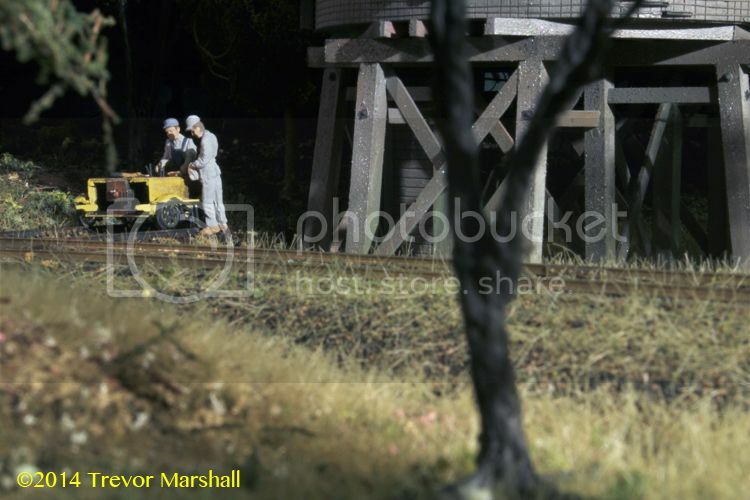 He can lean against the water tank to provide a roll-by inspection, or be working on something on or around the tank. A tool box would be a nice addition, too. But while it’s difficult to photograph because of the trees, it will be easy for visitors to spot and appreciate – providing they’re looking for such details. I like to build vignettes for people to discover – providing such vignettes are realistic (in the sense that they convey an authentic sense of life in the place and era I’m modelling). 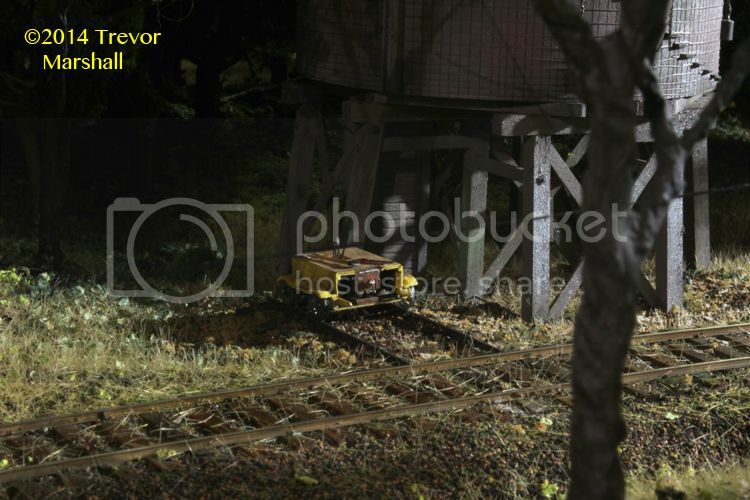 I love the idea of rewarding careful observation of my layout – and the little yellow speeder does just that in a way that (I hope) isn’t hokey or contrived. 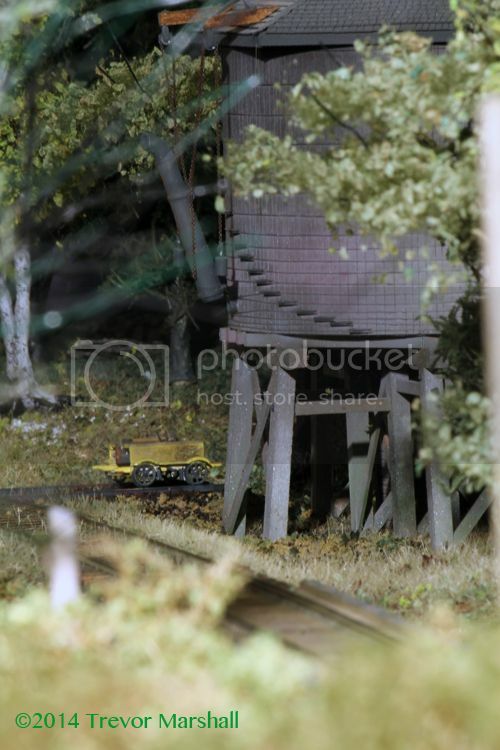 Many months ago (Okay: many, many months ago…) I mentioned that I had discovered a photo of the Lynn Valley water tank that showed a setoff for a track speeder. I’ve been meaning to add such a setoff to my water tank scene – but I kept finding other things to do. This week, however, I’ve been working on trees that will stand between the water tank and the fascia – and today I realized that if I didn’t get that speeder setoff built and installed soon, I wouldn’t be able to do so without damaging finished scenery. So the speeder setoff became this afternoon’s project. As the lead photo shows, it’s now in place and the ballast/ground cover is drying. I started by figuring out how much space I had, and what would work best for the base for this setoff. 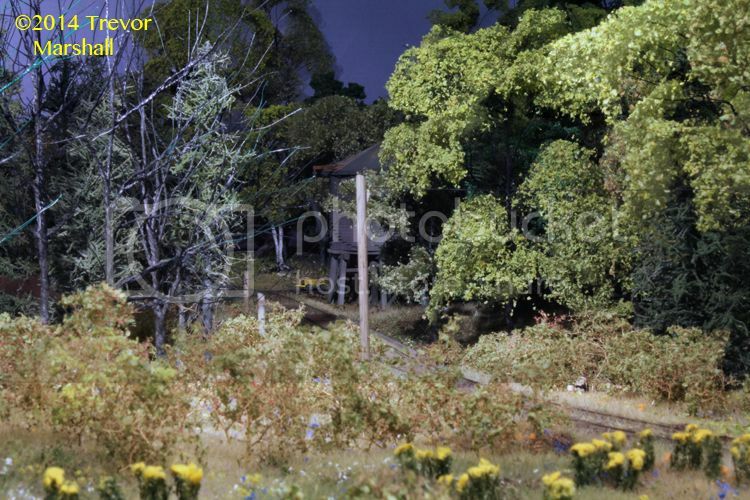 I planned to build it at the bench and drop it into place, then add ground cover to blend it into the scene. The setoff is about 2.5 inches long. I cut a square of 0.060″ styrene sheet to fit about half that length, and glued some ties in place with CA. I then distressed and stained the ties. 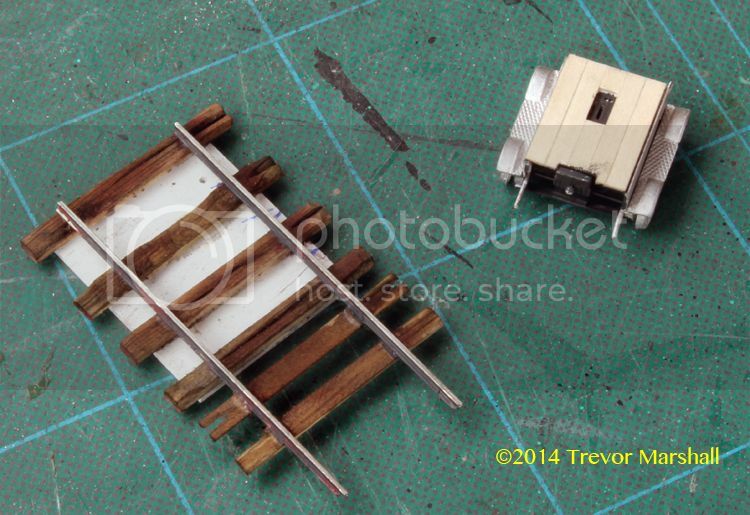 Next, I used CA to glue some short lengths of rail in place – gauged with an NMRA-style standards gauge. I cut the base shorter than the rails on purpose, since the rails would have to rest on the existing ballast. To complete the base, I shaved a tie into several thin sections with a razor blade, and used two of the best pieces to create a pair of profile ties. 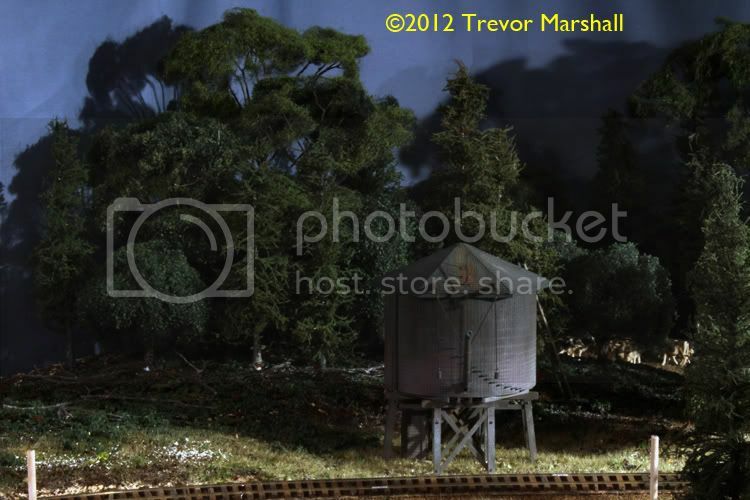 These would rest on the existing ballast on the layout, and be blended into the scene with ground cover. In the above photo, I’ve glued the setoff in place on the layout. I used CA on the underside of the rails to glue the setoff to the ties on the mainline. Since the ballast slopes away from the track, the far end of the setoff was hanging in space. I threaded a pair of brass rods through the two holes in the base and pushed them into the terrain underneath. Then I added some thick CA to the rods to secure them to the styrene base. In the photo below, I have spread a mix of ballast and ground foam around the setoff and glued it in place with dilute Weld-Bond. The white in the photo is glue that has not yet cured. 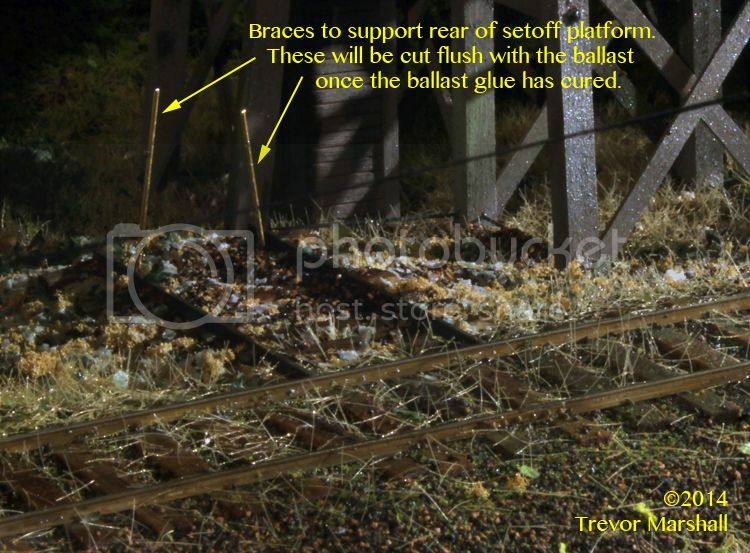 As the photo notes, when it has cured I will snip off the brass rods flush with the top of the ballast. The completed track speeder will cover any portion of the rods that I can’t snip flush. 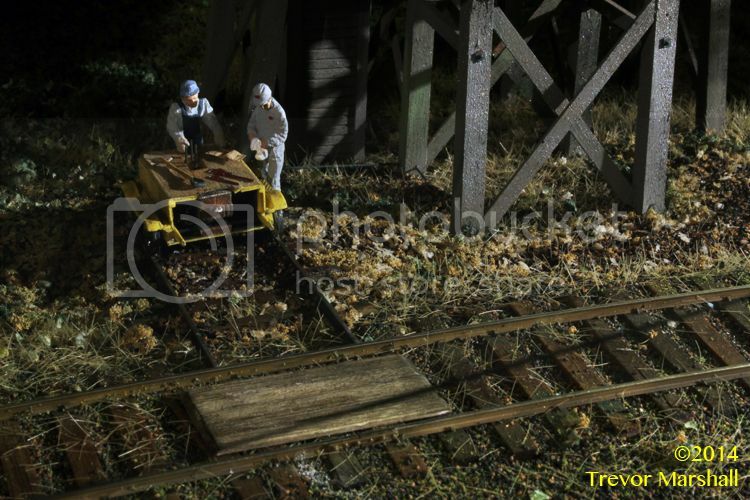 I will also have to add a few boards between the rails of the main track to facilitate moving a speeder between the track and the setoff. I’ll do that once the ballast glue has cured. Given that the past few days of dealing with the drains at home pushed my stress level into the red, I took the day off yesterday. I loaded up the dogs and the camera equipment and the three of us drove a couple of hours to the south west so that we could take a long walk in the Lynn Valley. It’s only my second time to the Lynn Valley and it was ideal for picture-taking. 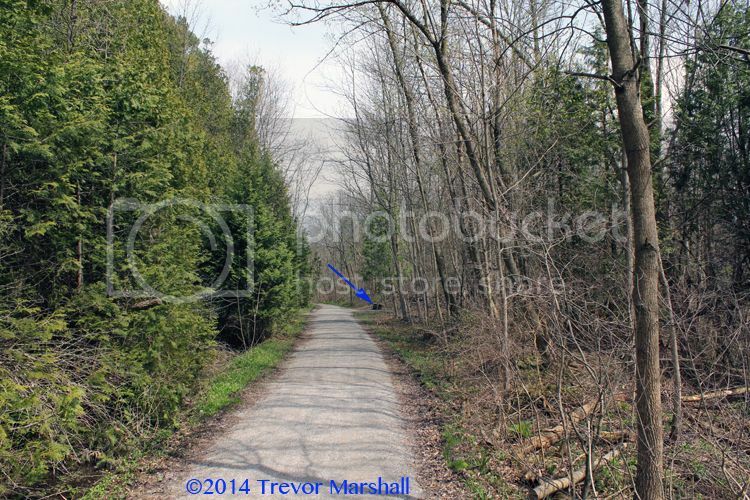 It was partly cloudy and the trees have not yet come into leaf so I was able to really see the contours of the land and how the forest and river related to the long-gone railway. In some locations – such as the area captured above – the trees form little more than a windbreak and thin visual barrier between the roadbed and the adjacent fields. It’s likely few trees were in this location 60 years ago. And that makes sense, as the Lynn River and the railway have drifted apart in this area. The river is behind the trees at left in the distance. 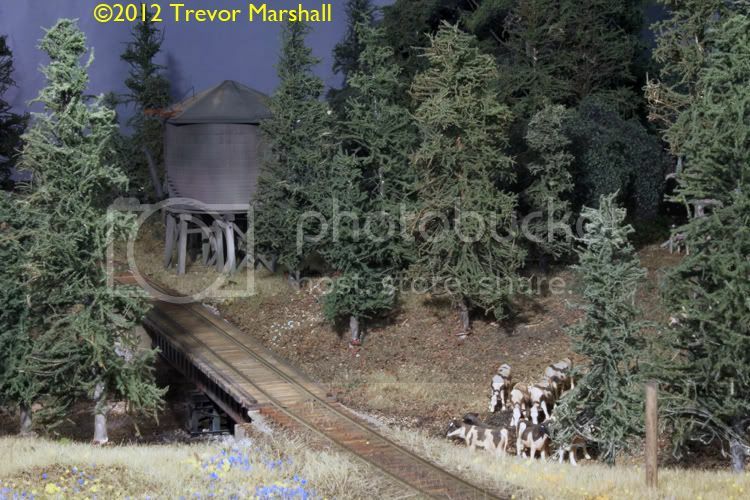 This was taken to the north of what’s known as “Burt Bridge” – a trestle similar to the one I’ve modelled. 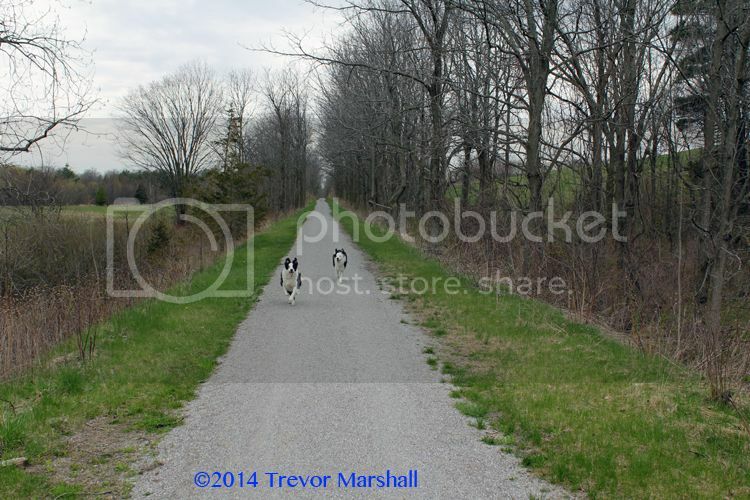 (My trestle is based on one that’s known as “Robinson Bridge”, further south on the rail trail.) I’m facing south – with the river just out of view to the right – and the arrow points to what I believe is the location of long-gone Lynn Valley water tank. It was a beautiful day – just what I needed to clear my head of this past weekend’s plumbing problems. And I came back from the Lynn Valley with plenty of ideas for the layout. Stay tuned! While looking for something else, I came across a stash of Scale Tree armatures in a rubber tub under the layout. But, I have a lot of real estate to cover, and some of that real estate is a couple of actual feet away from the fascia. I have a deep corner behind the water tank in the Lynn Valley, and I realized the Scale Tree armatures could be put to good use there. 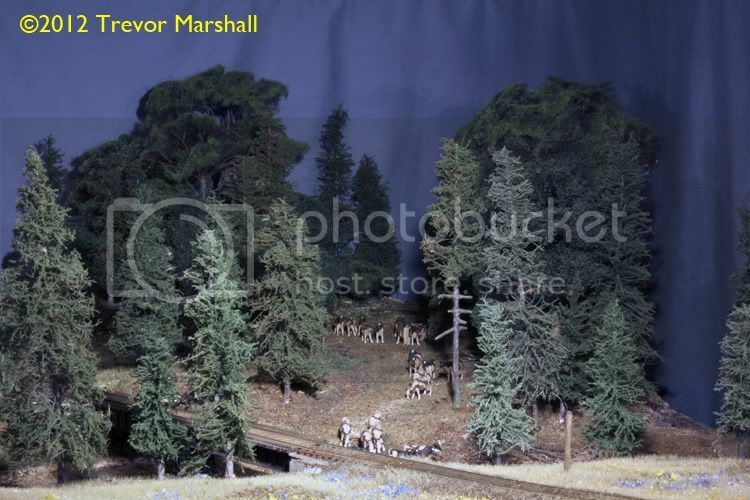 So, today I built some trees – trimming and shaping the armatures, adding netting, spritzing with hair spray and sprinkling on leaves by Selkirk Scenery and Woodland Scenics. 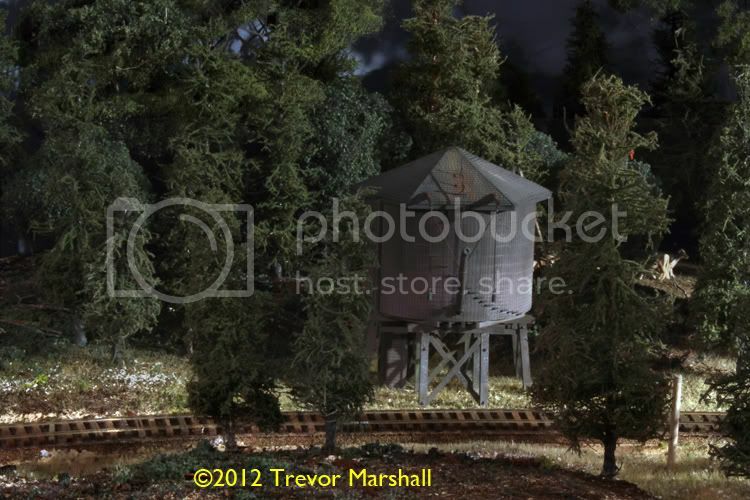 They don’t hold a candle to Gordon’s trees, but they fill the corner and allow me to put my full effort into the foreground models. It pays to review one’s resources on occasion. 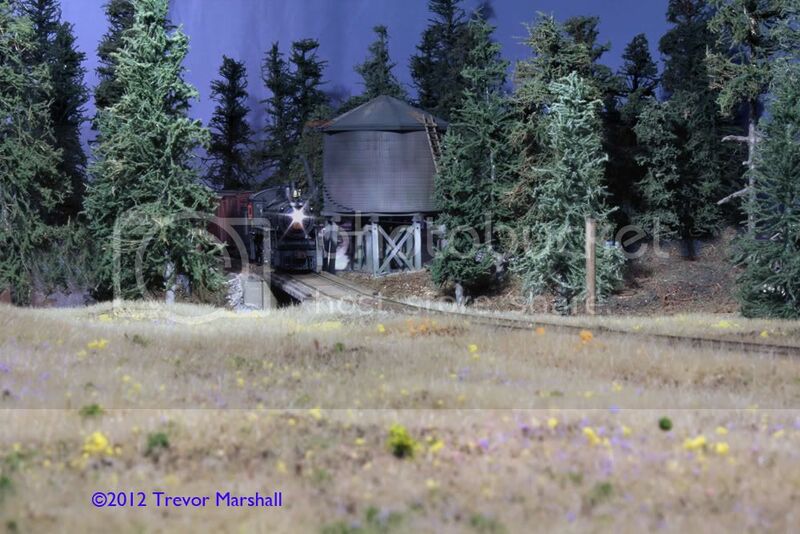 The photo is from the Hamilton Spectator newspaper and it does not show much of the tank – or the train that is taking water. But what has me excited is that it shows a speeder set off next to the tank. I haven’t seen that before. Thank you, Charles, for publishing this photo! In previous posts on the Lynn Valley water tank, I asked about the connections to the lever on the top of the tank that the fireman uses to control the flow of water. As with so many things, the answer is, “Google it”. 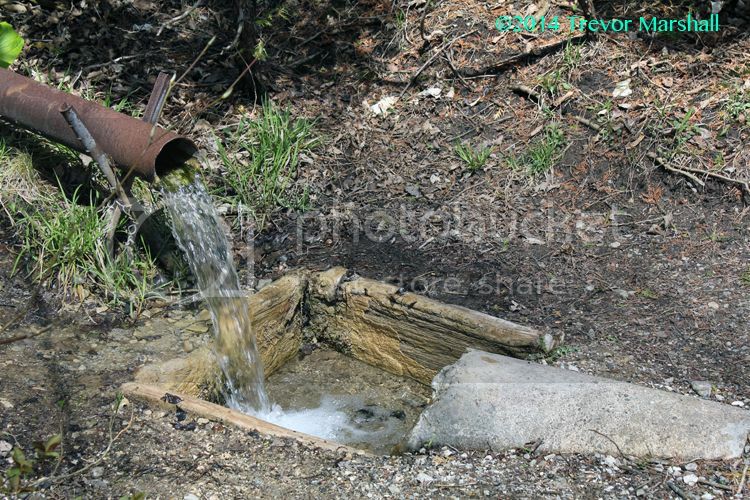 I did and found an article from 1899 on water stations. It includes Figure 633 – a drawing of the mechanism that operates the valve – along with a description. The valve connection of the discharge pipe with the tank is shown in Fig. 633. The connection may be made either through the side or bottom of the tank. The bottom valve connection is shown in the figure. The valve rod a is attached to the short arm of the lever b. The weight c, attached to the end of the short arm of the lever, holds the valve firmly in place. A rope is attached to the end d of the long arm of the lever and hangs within reach of the engineman. By pulling down on this rope, the valve is raised, and the water flows through the discharge pipe a to the tender tank. The vacuum pipe f admits air to the discharge pipe after the valve comes to its seat, so that the discharge pipe is quickly voided. Having read this, I’ve decided that the second chain connection on the lever is, indeed, a weight. I’ve also learned of a detail not often seen on model water tanks: The vacuum pipe to help drain water from the discharge pipe after the valve closes. This would be similar to the pipe at the top of a plumbing stack – a detail not often seen on models of houses. I will add a short piece of brass wire through the roof of the tank to represent this pipe. 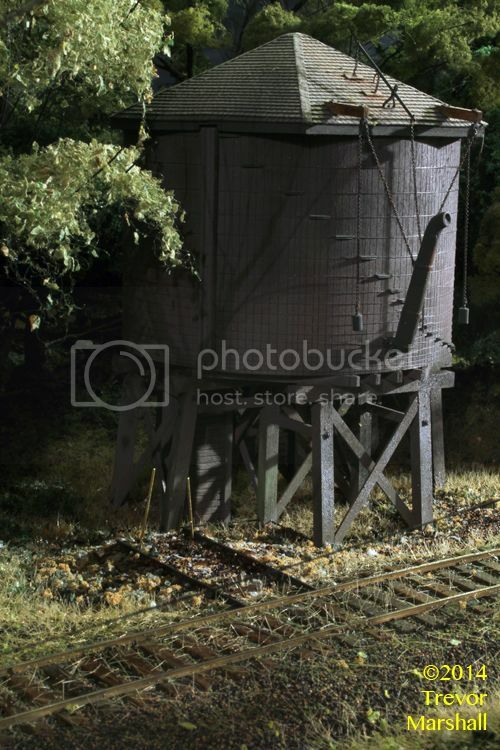 As an aside, this site includes some interesting information on a number of typical railroad structures. 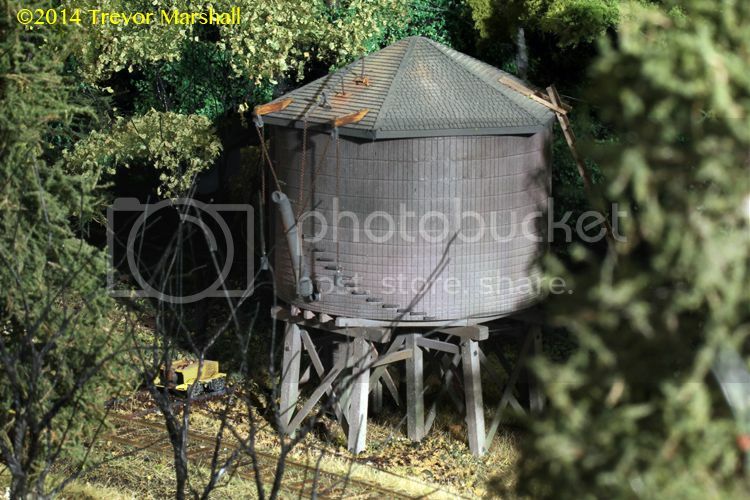 I’m sure there are more but little things to be done, but essentially, my model of the Lynn Valley water tank is complete. 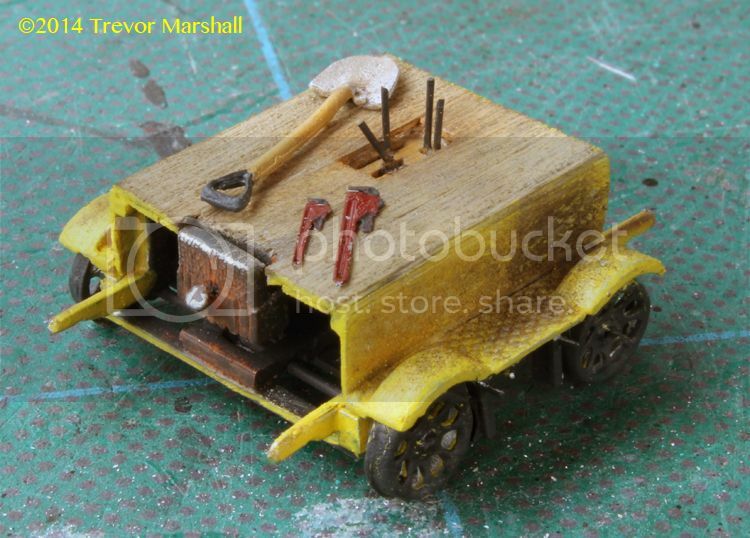 I may add a lightning rod, or not: I don’t see on in the prototype photos I have so I’ll leave it off for now. In the end, I made many modifications to the kit I purchased from Altoona Model Works*. That said, knowing what I know now, I would definitely purchase the kit if I were building this model again. It provided the raw material, the detail parts, and a good set of instructions to get me started. 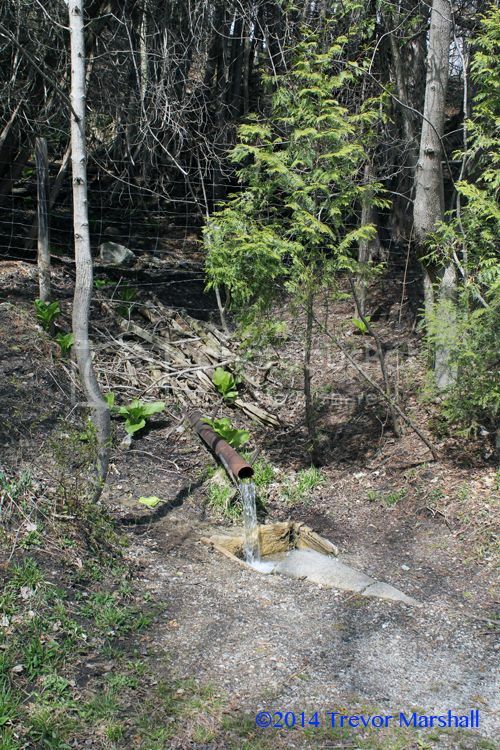 Lynn Valley water tank: Thanks Robert! Robert took this photo on December 5, 1953. It shows CN 2-6-0 #85 pausing for water. As an aside, I’m told this train is most likely backing towards Port Dover (to the right) in this scene. Apparently they did that, which would have made for a pretty slow seven-mile trip to the end of the line. Note how the tank is on the outside of a gentle curve here. I discussed this challenge this has presented for me in a previous posting. I’m particularly intrigued by the lever on the top of the tank that controls the flow of water. The fireman is pulling on a rope to start the water flowing. The other two lines in the image are fine chain attached to the counterweights that balance the spout. Sharp eyed viewers will note the lever has three connections – just above the roofline of the tank. 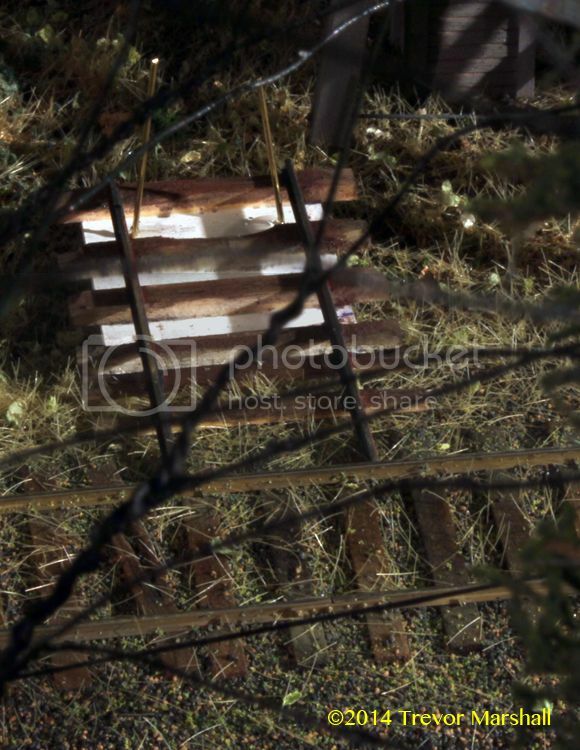 From other photos, I’ve determined that the one closest to the tracks is the fulcrum for the lever. Of the other two, one will be the chain that pulls on the mechanism to start the water flowing. But what’s the third connection? Could it be a weight suspended inside the tank to help return the mechanism to the closed position? I don’t know. If you have any information, please offer it up in the comments section. Thanks!